Does The Puppy Come With A Health Guarantee? Yes, each puppy comes with a 1 year health guarantee. 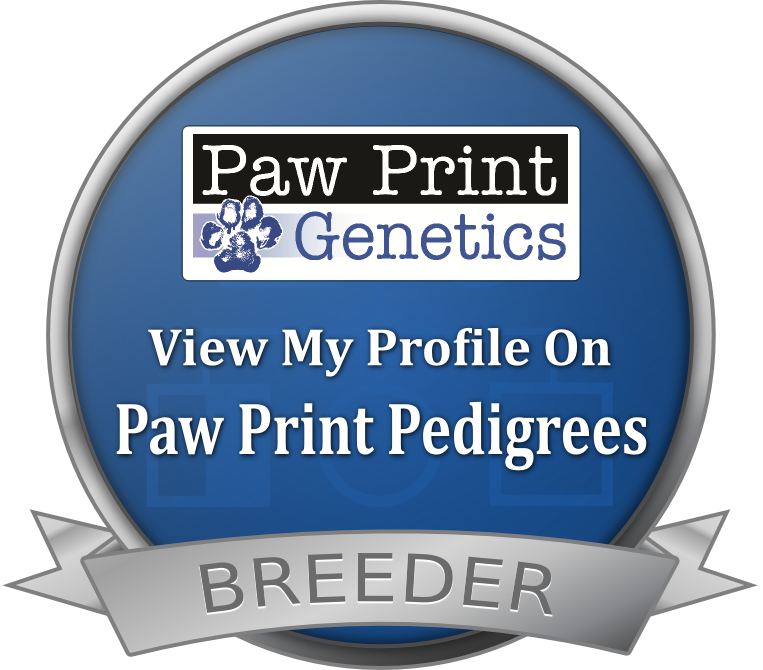 Our dogs are genetically health tested through PawPrint Genetics. We have full transparency with our results, which we have made public through Paw Prints Genetics. Click on link below to access. We DO NOT ever breed dogs together that can pass on a genetically identifiable disease, as our puppies' future health is very important to us. Will My Puppy Be Vaccinated and Dewormed? Puppies are give the first dose of a 5-Way Vaccine between 6-8 weeks. The 5-way vaccine is given in a series of 3, in increments of 3-4 weeks, depending on your vet. So you will have to continue the vaccine schedule for your puppy to have maximum immunity. We do not give the rabies vaccine to the puppies, as they are too young. That is something that should not be given until the puppy is at a minimum of 4 months old. When Are Pictures Taken Of The Puppies? We take individual pictures right before we start puppy selections, so people have an up to date picture to select from. Sorry, we do not take personal checks. Do You Provide Fully Trained Service Dogs? 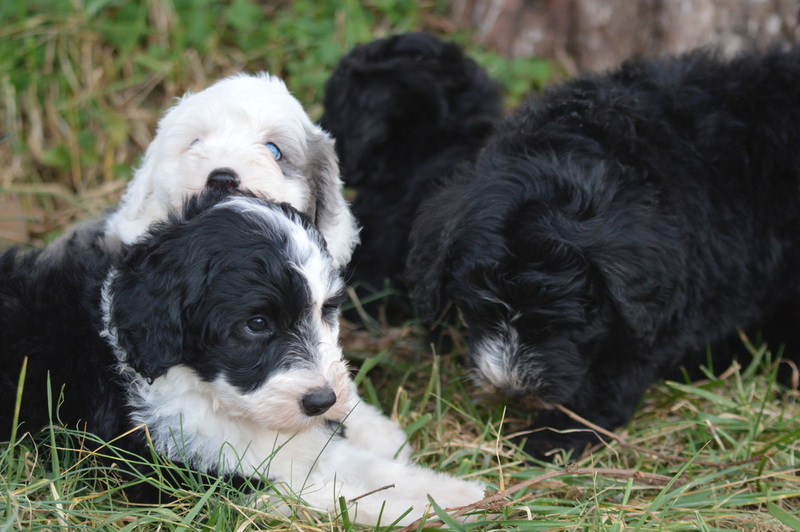 Are The Sheepadoodle Puppies Tails Docked? 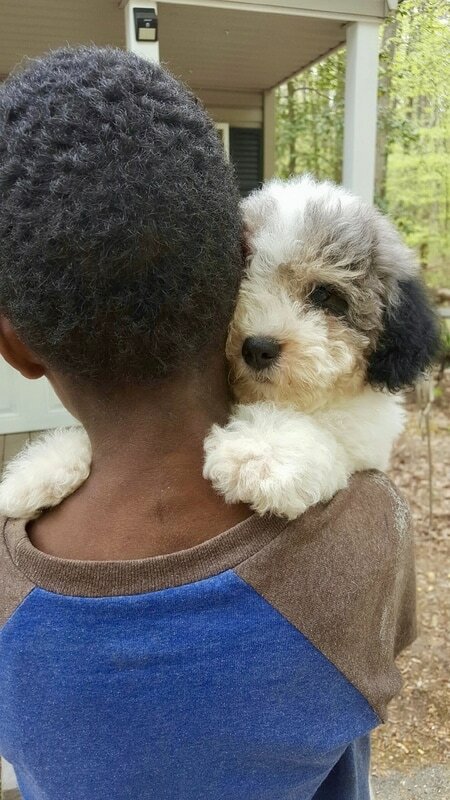 Our Sheepadoodle and Bernedoodle puppies' tails are left natural and undocked, unless otherwise requested by a puppy buyer. Only puppy buyers who have placed their deposits can make a request for the tail to be docked on their puppy. Buyer must notify breeder by the time the puppy is 48 hours old of their request to have the tail docked. (Tails will not be docked past 3 days old) You must reserve 1st or 2nd pick of the litter to request your puppy's tail to be docked. 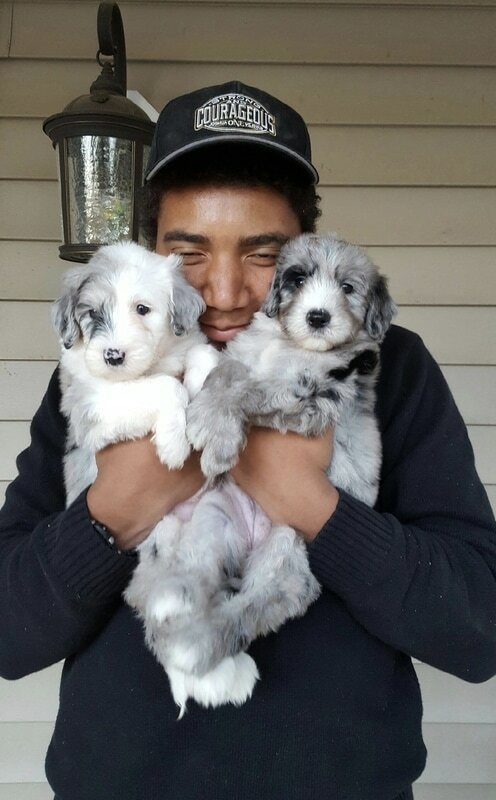 See Available sheepadoodle or bernedoodle page for more information on how to reserve pick of the litter. If I Live Far Away, What Are My Transportation Options? 1. You can fly here to Washington Reagan National Airport (airport code DCA) to pick up your puppy. And we can meet you at the airport, with your puppy. (you will need us to take your puppy for an additional appt with the vet for a Flight Health Certificate, as required by the airlines. There is an additional $255 charge for the Flight Health Certificate, which you will need to add to your balance) Please make sure you bring a soft carrier for your puppy that meets your airlines specifications. 2. You can travel here, to Washington DC and make a vacation trip out of it, and see the sights & pick up your puppy before you return home. Will My Puppy Be Accustomed To People? 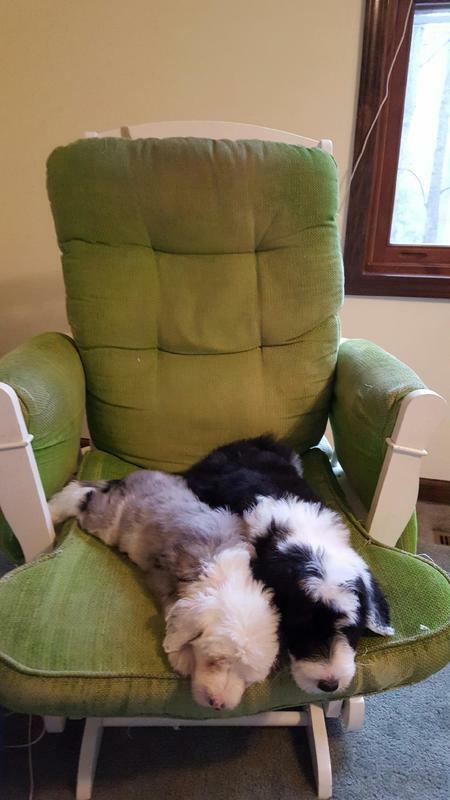 The puppies like to be rocked to sleep in the kids' favorite rocking chair. Yes, your puppy has been gently petted and cuddled since birth by our family. We feel that human imprinting from day one, makes for a better family pet. Imprinting is a form of learning that happens at an early age and lasts the lifetime of the animal. The first person to thoroughly investigate the imprinting process was the Austrian ethologist, Konrad Lorenz, who won the Nobel Prize in 1973 for his contributions to animal behavior. Imprinting takes place during a relatively brief period of time called the sensitive period, after which the information learned during the imprinting process either cannot be or is very difficult to reverse. 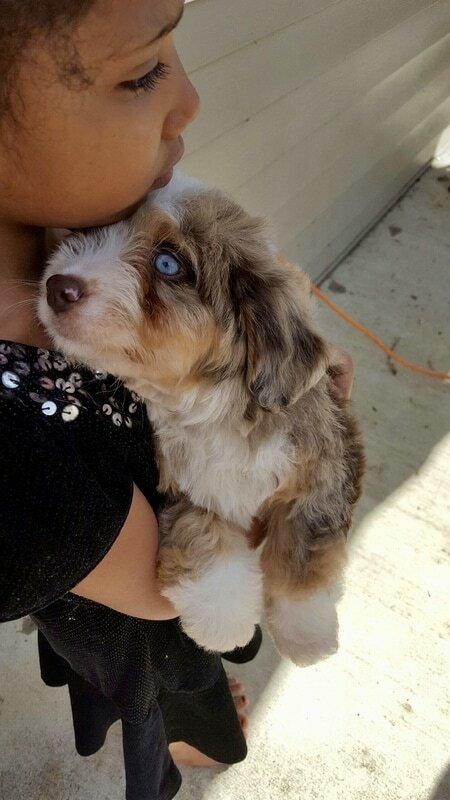 Yes, puppies can give hugs. Yes, you are seeing this right. 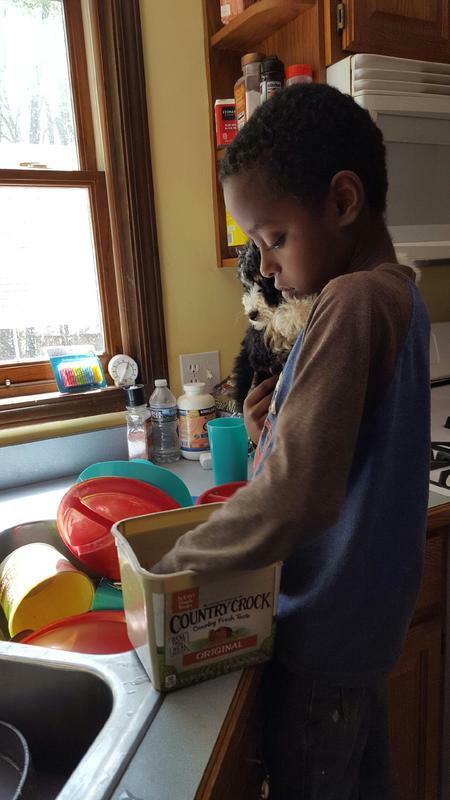 He is washing dishes while holding a puppy. Puppies make chores a lot more fun! Even our teenagers can't resist puppy cuddles! 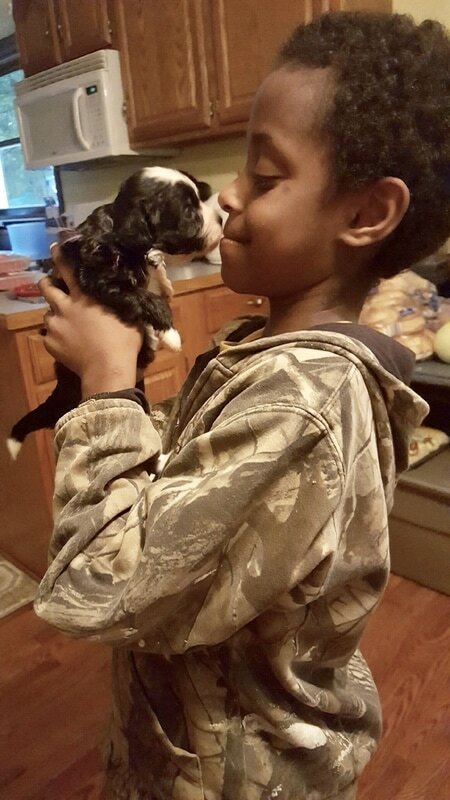 We love for people to visit us and pick out their puppy in person. (we do understand that sometimes this is not possible for some families.) We do provide photos, videos, and detail descriptions of each puppy to help with the selection process. After you have selected your puppy, your 2nd visit will be when you pick your puppy up. Each puppy buyer is allowed up to 2 visits. 1st visit is to make their puppy selection in person. 2nd visit is always at 8 weeks when you come and pick up your puppy. We do not allow additional visits, as we try to limit the amount of contaminates that are brought onto our farm. This is for the safety of all of our animals and for the safety of your puppy. (parvo, among other contaminates, is highly contagious and can even travel on the soles of ones shoes. Parvo kills many puppies each year. We have never experienced an outbreak of a deadly disease on our farm and we are trying to keep it that way) We ask that you don't visit another breeder or pet store (on the day of your visit) before coming to our farm. Please respect our 2 visit rule and do not request further visits. With raising 12 children & having a farm to run, we stay very busy. As much as we love our puppy families, we must keep our children as our top priority. 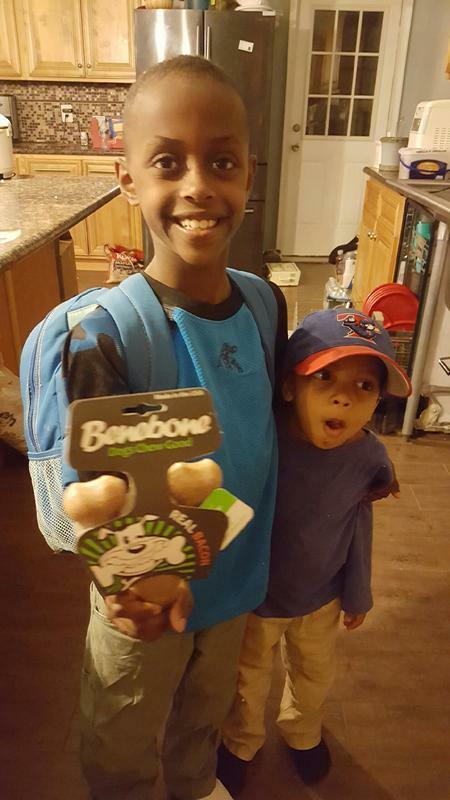 We want our children to know they are special and are important to us, so we have to guard our time so that we have time to spend with each individual child each day. Thank you for understanding! Please click on the button below to read our full visitation policy. What If The Timing Ends Up Wrong, Can I Transfer My Deposit To Another Litter or Receive a Refund? How Long Can We Stay On Your Waitlist? 2 years from the date of when the deposit was placed. After two years, the deposit is forfeited. What If I Can't Keep The Dog Due Unforeseen Circumstances In The Future? We require that you sign a contract saying that you will return the puppy/dog back to us, if you ever decide you cannot or don't want to keep the dog. It does not matter to us how old the dog is. We will happily take the dog back for ANY reason, at ANY point in the future. --but we do not return the payment for the dog, as we do not allow 'trial' periods and want each family to to make sure they are making a permanent decision when adding a puppy to their family. Do You Require A Spay Or Neuter Contract? What Brand of Food Will My Puppy Be Used To Eating? Diamond Puppy Formula (Purple bag with a strip of pink at the bottom. ) If you can't find Diamond Puppy near you, Blue Buffalo Puppy is another good option. What Has Been Your Feeding Schedule For the Puppies? We have water and dry puppy food available at all times during the day to the puppies. We mix in 1 Tablespoon Coconut oil per 1 cup dry puppy food. Coconut oil has many health benefits for humans and dogs alike. We also feed our puppies cooked salmon, ground beef, chicken, turkey and eggs. We feed whole fresh food to our adult dogs, in addition to dog food, as it is more nutritional dense than dog food, so we do the same for our puppies. Do I have to take my puppy home exactly on Puppy Pick Day? You must pick up your puppy within 3 days of your puppy's Puppy Pick Up Day. If you need your puppy to have an extended stay with us, then you can select the Trained Puppy Program. See Trained Puppy Program tab near the top of the page for more information. Can You Tell The Eye Color At Birth? No, puppies are born with their eyes shut and their eyes don't open until 10-14 days old. Then their eyes look rather blueish/grayish. It is not uncommon to not be able to tell for sure whether or not a puppy will have blue eyes until they are 4-8 weeks. What size collar to get for my puppy? I recommend the 10-14" flexible puppy collar. It is soft and super adjustable and inexpensive. Click on the link below to see an example of this type of collar. It is very important that your puppy gets a 5-way puppy shot at 16 weeks old. This is when the vaccine is the most effective, as the maternal antibodies are gone and no longer interfere with the effectiveness of the puppy's vaccine. If you stop vaccinating before 16 weeks, then the puppy may not be fully protected. Our puppies are preventatively wormed at 2,4,6, and 8 weeks. And we recommend that you continue to worming schedule at home. Wormer can be purchased from you vet, your local pet store and online. All wormers are not the same. Make sure the wormer you get has pyrantel pamoate in it or fenbezadole. ​If we decide that having a puppy is too much work, after having the puppy for a few days or weeks, can we return the puppy & get a refund? ​No, we do not offer test run puppies or refunds. Getting a new furry family member is a serious decision and a big commitment. Make sure you are up for the commitment before placing your deposit. You may return the puppy or dog to us, at any point in the dog's lifetime, but no refunds will be given. Do We Ever Have Trained Older Puppies Available? 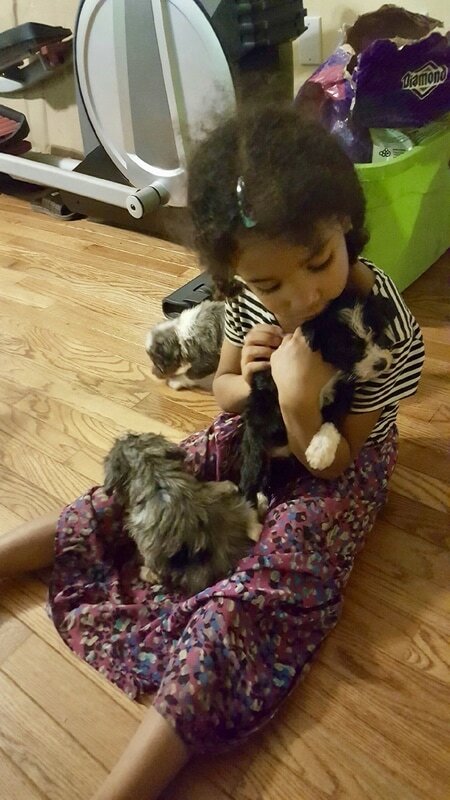 In response to past requests, we have decided to add a "Trained Puppy Program" to our breeding program. We understand the demands raising a baby puppy can bring with it in relationship to holding a full time job outside the home and the very many other facets of our lives that can have an impact on us. Many people just prefer older puppies and dogs to avoid some of the work a baby puppy can bring to the table. Therefore we are attempting to help people that want a puppy to be able to choose a puppy they really like as a baby, and to meet their personal criteria for getting one. We currently allow only 2 to 3 puppies to be enrolled in the older puppy program at one given time. We allow other enrollments as space is freed up. This helps us maintain a safe and healthy environment for the puppies enrolled in the program as well as our own dogs and puppies. In addition small enrollment helps support more one on one attention to individual puppies. To ensure safety and health, only puppies born from our dogs and purchased from our facilities are allowed in the Trained Puppy program. ​See Trained Puppy Program near top of page for more information. Our adult dogs get daily vitamins and organic coconut oil. This is where we get these items from. Are You Afraid of Your Puppy Getting Hip Dysplasia? Did you know that there are environmental factors that play a large role in whether or not a dog gets hip dysplasia? It is not all genetic. Read articles in the below links. We are careful not to overfeed our puppies. Although, we do health test, we believe the science that says that a dogs environment (over feeding & early spay/neuters), has just as much of an effect on whether or not a dog will end up with hip dysplasia. Is there truth in hybrid vigor? The Institute of Canine Biology article on the data results on a 27,000 dog study. Biosensor or "The Super Dog Program", is a method used to develop high achievers. Early neurological stimulation exercises could have important and lasting effects. Studies have confirmed that there are specific time periods early in life when neurological stimulation has optimum results. The first period involves a window of time that begins at the third day of life and lasts until the sixteenth day. It is believed that this interval of time is a period of rapid neurological growth and development, and therefore is of great importance to the individual. 5. Thermal stimulation - use a damp towel that has been cooled in a refrigerator for at least five minutes. Place the pup on the towel, feet down. Do not restrain it from moving. Time of stimulation 3-5 seconds. -- Scroll Down to see more videos on this topic. Foods - specifically chocolate, xylitol, and grapes/raisins. Mouse and rat poison - rodenticides. *Our note: Do not forget Gorilla Glue! NSAIDS human drugs - such as ibuprofen, naproxen. Household cleaners - sprays, detergents, polishes. Antidepressant human drugs - such as Prozac, Paxil, Celexa and Effexor. Fertilizers - including bone meal, blood meal and iron-based products. Acetaminophen human drugs - such as Tylenol and cough/cold medications. Amphetamine human drugs - ADD/ADHD medications like Adderall and Concerta. ​Please note that puppies may pick up common parasites, such as Giardia, coccidia, roundworm etc. We do everything in our power to prevent and eliminate these parasites by putting dogs and pups on a strict de-worming program. However, mother dogs tend to be more vulnerable to parasites when they are pregnant or have puppies, and may pass them along to the pups. Depending on the life cycle of the particular parasite, it is possible that a few pups will go home with one. Please keep your puppy on the preventative worming schedule of every two weeks until the puppy is 20 weeks old. Do We Get To Come In and Tour Your Home? We don't allow puppy visitors in our home. When you add children to your family through adoption, who have experienced traumatic loss, you have to be very conscientious to provide them a secure home environment. Strangers can trigger anxiety and we try to have our home be a safe oasis for our children. And as nice you might be, our children don't know you and thus don't know if you are safe. And we don't want any of our children to feel on edge because their are strangers in their personal space. But to give you an idea of how we live, here is a video of the farm/home we moved from. 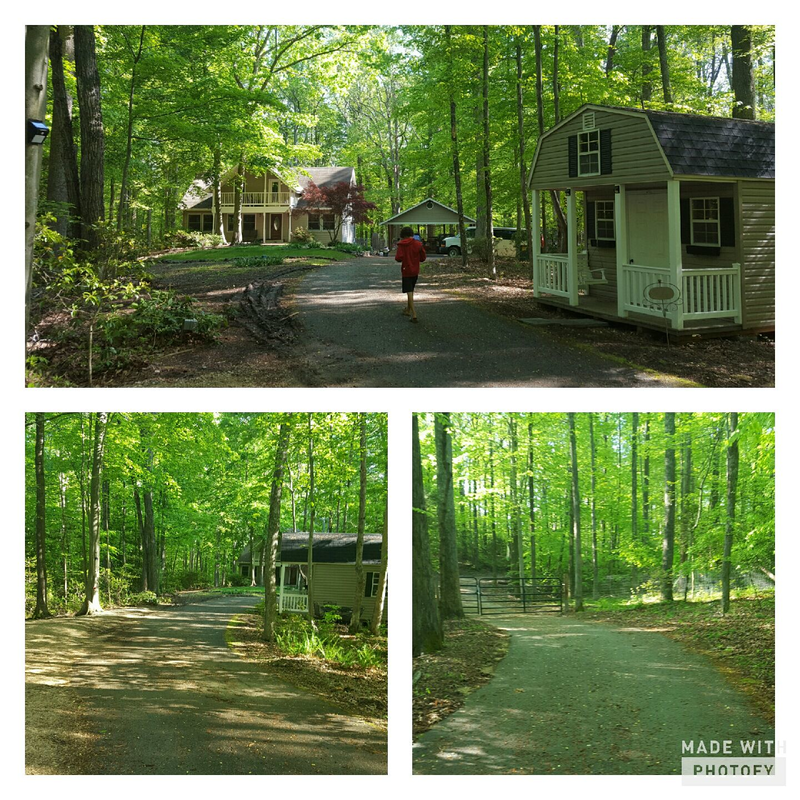 We bought this as a fixer upper and worked on it as a family, doing drywall, flooring, painting, kitchen, bathrooms, electrical, etc... We had lots of fun putting the house together. The stone that is on the front of the house, we bought off craigslist. The pillars, we got at the county landfill and with a good cleaning and paint they gleamed once again. We hunted down appliances at yard sales. And as a family, worked on our drywalling skills. :-) We installed the kitchen cabinets. It was a fun project. We recently moved see video below, and will be providing exterior video soon. There are many different pet insurance options. Some have caps on coverage and others do not. It is best to shop around. Why Is It Important To Expose The Puppy to Different smells in the Neonatal Period? -Have been wormed at 2, 4, 6 and 8 weeks old. -Have been socialized and raised in our home with our family. Human imprinting from day one, which makes for an exceptional family dog. It is best to bring someone with you to pick up your puppy, because your puppy will be more comforted if they are being held, instead of in a crate. Young puppies sometimes experience car sickness, so bring ziplock bags and towels. (many puppies grow out of this when they reach adulthood) If it is a long drive home, plan to make multiple stops to let your puppy out on the leash for fresh air and potty breaks. Your puppy will be sad the first few days and will need to adjust to not being with its mother and siblings. Just be patient with him or her and provide lots of hugs, cuddles and attention. Puppy toys also will help to preoccupy your puppy. Sometimes the stress of a moving to a new home, can cause a puppy to have loose stools. If this happens to your puppy, take him/her out more frequently. His stomach should settle down within 2-3 days. It is best to not feed your puppy when he/she is inside their crate. (only feed outside of the crate) This will make house breaking your puppy much easier. We feed the 'Dog Dish Diet'(see our FAQ page for more info) and Diamond Puppy Food. We let our puppies eat as much dry food as they want. (Free feeding) Do not feed canned dog food to the puppy. The puppy can overeat until he bloats and have diarrhea and vomiting. We provide well water do our puppies and dogs. Sometimes, puppies need time to get used to the chemical taste in some city water. If your puppy is not wanting to drink water. You can add some orange gatorade to his water to disguise the taste. As soon as your puppy wakes up in the morning, open the crate and taken them outside to the potty spot IMMEDIATELY. After every you give him his meal of puppy food and water, take him out to the potty spot. Every time you take him out of the crate, take him out to potty first, before playing with him. It is good to establish a potty word or phrase and say it to him every time you take him to the potty spot, like, "go potty," or "do your business." And take him out to potty before going to bed. The crate is just used as a training tool, so don't leave your puppy in it all the time. If you buy a large crate, partition it off, so your puppy is only in a small area. You want him to feel like it is his bed/den and dogs do not like to go to the bathroom in their den. If there is too much space in his crate, then he might decide, one side is for pottying and the other side is for sleeping. One he gets bigger, you can remove the partition. Many family have found that it works well to put up baby gates in the doorways in the kitchen or laundry room and then place the crate in that room, so that after you have taken your puppy outside, he can have a room to play and explore in without being able to wonder freely around the house, where he might get into something or have an accident. Once your puppy masters that one room and is not having accidents, then you can extend his boundaries. It is very important to socialize your puppy. Spend lots of time each day playing and cuddling your puppy. Take him out on walks and to the park where he can see other dogs and people. Let visitors come and give him attention. You do not want your puppy to grow up and be fearful of strangers. To read about vaccine schedules, please click on the link below. ~ Educating yourself is important for the health of your family and pets. ​All content on our website, including but not limited to photographs, forms, written text and graphics are copyrighted and are not allowed to be duplicated or reproduced without the express written permission.